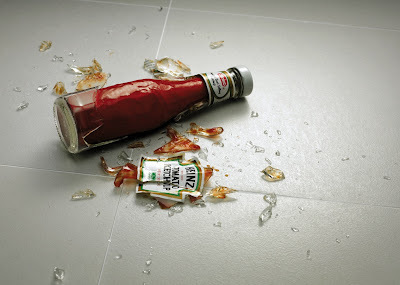 2WENTY 4OUR: Heinz Tomato Ketchup! 'America's Best-Selling Ketchup'... but I don't get it. Is it because it's an "unbreakable" brand position? All I know that in the UK they celebrate how thick the sauce is, and how long it takes to pour out of the glass bottle. There has been some nice work on this. So I assume the US have the same thoughts on it. I think it's a great execution. Probably it refers to the fact that it is not liquid like other ketchups. I felt that the content of the bottle is made from plastic. Can any body tell me the agency who did this ??? This is done by FP7 Doha.